Sally Connects the dots between what it means to be a business woman, loving mother and partner. embodying the art of bespoke beauty through sally geach bridal, she weaves some of herself into every single piece. sALLY USES HER CREATIVITY TO CONNECT TO AND collaborate with others, understanding the importance of investing your time and energy into the right people. A seamless construction of love and support IS WHAT SETS the whole experience with sally APART. Friendship, fond memories and female empowerment are the perfect accessory to compliment the dream dress. 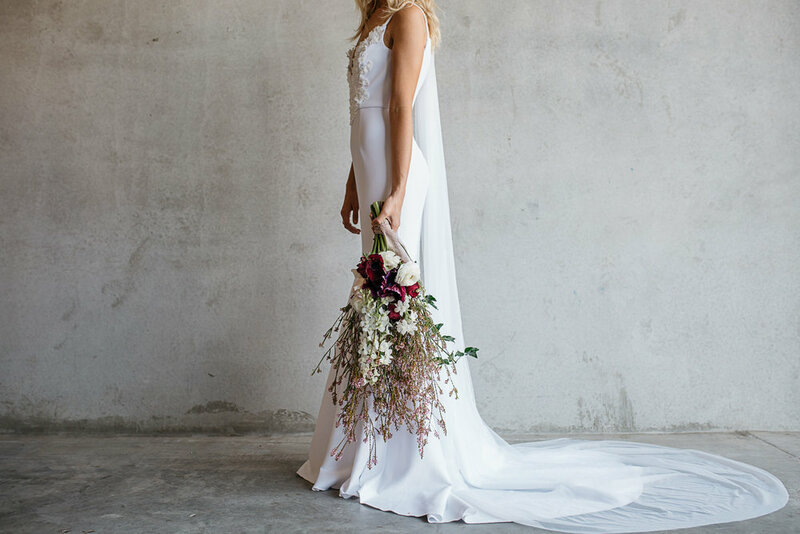 Tell us, WHAT'S THE IDEA BEHIND SALLY GEACH BRIDAL? As long as I can remember, I’ve always be creating. It started with little sewing projects and then turned into something bigger. I’ve always enjoyed making one off creations, lots of beading/lace work and what's more fitting than a wedding dress! I want to be able to invite people into my world and be part of it. SG Bridal allows you to select from custom made or soon to be an online store with an off the shelf collection. I want women to feel beautiful, glamorous and empowered when wearing my gowns. HOW DOES YOUR PASSION DRIVE YOU TO DO THINGS DIFFERENTLY WITHIN THE BRIDAL INDUSTRY? When something’s a passion, it comes from within. I feel like no one else has the same thought process or sees things the way I do. Design is an art and when a designer has true passion behind their design, there will always be difference. When you have a business you have to wear different hats; I have a business hat, a creative hat and a promoting hat. Keeping up with how people are shopping and what they are interested in is always important. When you visit SG Bridal, whether that’s in person or online, I want to offer a special experience, a step into my world and how to be a part of it. HOW DOES WHAT YOU DO INFLUENCE AN INDIVIDUAL’S ABILITY TO CONNECT WITH OTHERS? A wedding brings families and friends closer together. It's a special journey watching a woman embarking on a new chapter in her life. Throughout the process of getting a dress made, it is usually the mum, sisters and close friends that come along to fittings and it brings out so many emotions. There's usually a lot of tears at the final fitting when they pick up the dress, and being able to create this moment is just so special. I’m glad I get to be part of the process, connecting to others as they connect together. My inspiration comes from learning new skills. I love looking into beaded work and researching traditional styles of embellishment techniques. It intrigues me and I want to learn it all. I spend a lot of time watching youtube videos and teaching myself new approaches. It always brings out great motivation in me to create. WHAT IS YOUR MESSAGE TO WOMEN IN REGARDS TO DEVELOPING SELF-LOVE AND SELF-COMPASSION? I could talk about this question forever! But I’ll keep it short. Self-love and compassion doesn’t come naturally to everyone and it’s something you have to work at. I find it important to focus on the things that bring you happiness and build them up - this may be through work, health and / or relationships. I fill my days with things and people that lift me up as a person, this helps me keep my most important relationship - the one with myself - strong. It is something you should focus on everyday and re-visit often to make sure you are surrounding yourself with positivity. You need to have balance in life and it all starts by being happy within. Being my own boss. I’m just too driven and independent to work under someone else. I like being a leader and making all the choices, so being able to do everything my own way and be responsible for it all fuels me. Being my own boss allows me to have great flexibility with my work which is useful being a new mum, and it has allowed me to grow my family without having to sacrifice my career. HOW IMPORTANT IS THE SUSTAINABILITY ELEMENT OF YOUR DESIGNS? I find the art of fashion design has disappeared over the years as technology and ways of shopping has changed. Mass produced items and fast fashion is the most popular way to own new clothes. Designing for a bride brings it back to the true meaning of having an item of clothing made. I offer designs and then make them especially for the person, meaning one item is made per sale (not full size runs that end up getting wasted). My designs are timeless - meaning they don’t need to be sold in a couple of weeks before a new style replaces it. Sally, how do you feel you're making A POSITIVE DIFFERENCE? As a bridal designer I get to be part of such a special moment in a woman's life. I help them create the perfect dress that helps them feel beautiful and strong as a woman. When they step in a SG dress, they forget any insecurities or worries about their image and just feel amazing. I want to show women you can be a strong business woman, loving mother and partner. By showcasing my life and talent through my work, I hope to positively influence and inspire other woman all around the world. CAN YOU SHARE SOME TIPS ON DEVELOPING STRONG RELATIONSHIPS WITH OTHER PEOPLE? Building relationships with other people is important in life especially when owning a business. I find being genuinely interested in wanting to know a person's story is important. Put down the phone, give people the time of day. Step out of your comfort zone and meet people. Go to events, tell people what you do and get to know what they do. Connect by adding them on instagram, facebook and grabbing their business card. If you find them interesting or someone you can collaborate with, you should have this person in your creative circle. Socials are a great way to stay connected, so be sure to use them. My biggest tip is to put energy into the relationships that build you up not tear you down. That applies in both life and work. WHAT’S NEXT FOR SALLY GEACH BRIDAL? We HEART wellbeing, DO YOU?